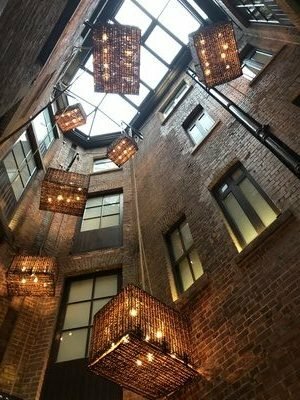 Last week we got a peek inside the IHG’s new Hotel Indigo Manchester Victoria Station. This is in the northern part of the city centre and just opposite the new Amazon HQ. It’s so new, it isn’t even open yet! 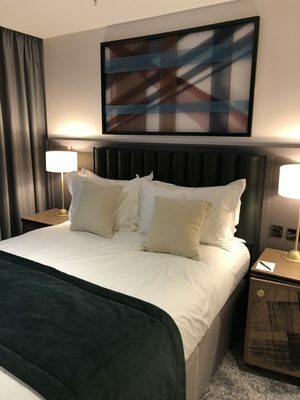 I was in Manchester to take a look at the new Crowne Plaza and Staybridge Suites properties which have just opened – those reviews will follow in a few days. We also asked IHG if I could have a hard-hat tour of the new Hotel Indigo and they generously agreed. The Hotel Indigo Manchester Victoria Station website is here. Like all Hotel Indigo properties, the concept for the interior design is taken from the surrounding area. Since Manchester was a hotspot for industrialisation during the 19th century, this hotel takes its cues from tea, printing (think the Manchester Guardian, as was) and cotton production. Floors are alternately themed, as you can see when you compare the interior of the rooms. And a bathroom, featuring me! The hotel also has a (small) gym with a couple of running machines, a bench press etc. It’s the location that really sells the Hotel Indigo Manchester Victoria Station, together with what looks like an excellent restaurant, bar and cafe. The hotel, next door to Victoria rail station and on the edge of the bohemian Northern Quarter is very close to Selfridges, Harvey Nichols and the ‘upscale’ side of the city centre. The rooms themselves are generally on the smaller side and it will be interesting to see how they wear. They are more boutique-y but slightly less premium than the new Crowne Plaza, as you’ll see from my review in a few days, and will probably attract a younger and more leisure-oriented customer. The hotel is hoping to open in the next few days. Room rates for mid-week dates are around £135 or 30,000 IHG Rewards Club points. The points value, at least midweek, is slightly above Rob’s target valuation of 0.4p. You can see more about the hotel on the IHG website here. Thanks to IHG and the Indigo team for letting me interrupt their busy construction schedule. Looks great! Any idea when the new Hilton Garden Inn at Heathrow terminal 2 will open? February-ish I think. Same owner (Arora) as the new CP T4. The guys who own this new Indigo own the new Staybridge / HI about to open at Heathrow in a few weeks (Bath Road). Why is Richard Osman (of pointless fame) at the reception desk? Locally produced tea probably just means there’s a tea merchant in Manchester (like Taylors in Yorkshire who make Yorkshire Tea, and Ringtons in Newcastle) that blends locally. Distinction: locally produced and locally grown. 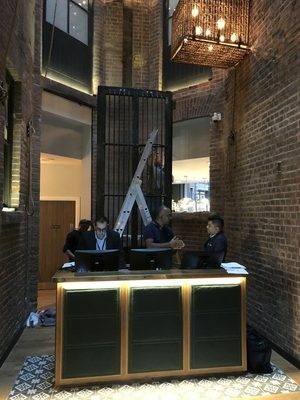 The new Hotel Indigo Manchester Victoria Station is a good one to start with, so let’s carry this on in the future after the new Hotel Indigo Manchester Victoria Station! 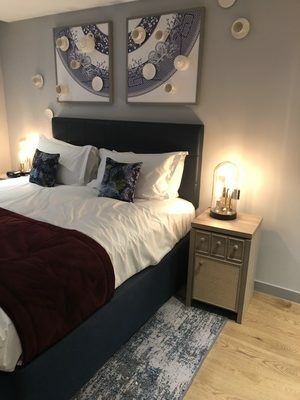 Looks excellent – I’ve had nice stays at a number of Hotel Indigo properties now, definitely one of my favourite IHG brands. Worth mentioning amazon is opening offices in Manchester, Cambridge and Edinburgh …the HQ is still staying in London, these new offices will not be HQs! I used to stay at the V&A in Manchester when it was Granada themed. The Sherlock Holmes room was quite fun with the flickering Coach Lamp by the door. There were various Coronation Street themed rooms too and it wasn’t uncommon to see Granada celebrities in the hotel. The week I spent in the “Mrs Merton” themed room was quite memorable. Picture of Malcolm by the bedside and on the wall a life sized framed poster of Peter Stringfellow hugging Mrs Merton with spotlights that were connected to the same circuit as the bedside lights. Quite startling to wake up to. The Great John Street Hotel roof terrace once looked down onto the (old) Coronation Street set. I was always surprised that they actually mentioned this in their marketing. One of the UK’s longest TV ‘soaps’ I’ve never watched in my 55 years! Those were the days, Kylie was Kylie and Jason was red blooded. That’s about as far a me & soaps go. How do I know (or find out) whether I will earn points for 2 rooms Melia? As in, I booked 2 rooms at a Melia hotel – both are under my name with my MeliaRewards number. 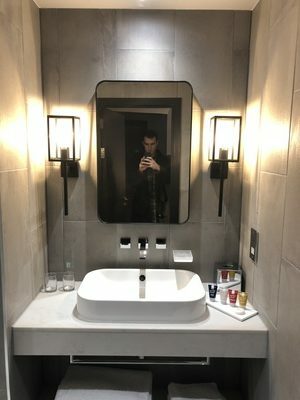 I know some hotels allow it but others don’t – does anyone know about MeliaReward? Rob, you have been providing more coverage for the Melia program lately. Stayed here last night. Booked a king.. Got put in a twin that was wedge shaped and you couldn’t see the TV. No response to my email complaining.